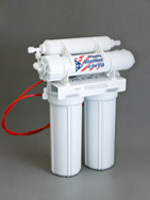 Reverse osmosis is the most complete and effective home treatment for drinking water. It's reasonably economical to own and operate, and a high-quality reverse osmosis unit will provide delicious and healthy drinking water for years. You'll find us different from most internet sellers in that we're a real live water filtration business operated by real live people who install and service reverse osmosis units (in our local area) and who can give you information and advice about products by phone or email. If we sell it, we can tell you how to service and repair it. And we stock parts for everything we sell. 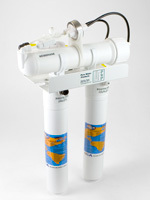 This is our standard undersink reverse osmosis unit, custom built with the best parts available. Our Q-Series units are designed to be the easiest to install and maintain, with unique “twist-in” cartridges. No tools necessary. 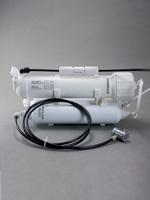 The Economy RO unit is a low-priced, complete undersink reverse osmosis unit from a top parts manufacturer. We sell it "as is" without modifications. This may be the best buy in water filtration, offering the best in water technology at a fraction of the cost of undersink units. Tank-free countertop units use some of the same high-quality parts as our Black & White units, but they are not for everyone. They lack the convenience of tank-style undersink units, producing water at a slow, steady trickle. 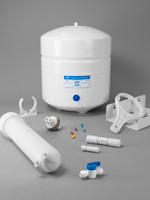 Parts for reverse osmosis units, including shutoff valves, fittings, tanks, faucets, filter housings, mounting brackets, RO tank valves, drain saddles, inlet saddle valves, filter wrenches, TDS testers, tubing, flow restrictors and more. 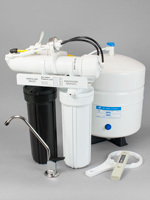 What does a Top Quality RO Unit Remove from Tap Water?